Sport fishermen travel from all parts of the globe to fish in the 1000 Islands Region. Here you will find some of the greatest fresh water sport fishing in the world. A large number of professional fishing guides and fishing charters offer their services throughout the Thousand Islands Region. Bring your own gear, tackle and bait, or some guides and charter services provide all you’ll need. The Thousand Islands Region is famous for northern pike, black bass, pickerel, perch, bullhead, smallmouth bass, largemouth bass, walleye pike, and muskellunge (commonly called Muskie). 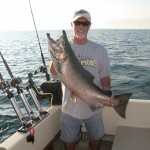 Salmon and lake trout are abundant in eastern Lake Ontario. Let these fishing guides lead you to their favorite fishing spots.